Ever since Back to the Future II, people have wanted shoes with power laces. Well, it’s happened. Nike has finally put power lacing in real shoes. In real life. As in, you’ll actually be able to buy them. And you’ll never have to tie a shoelace again. 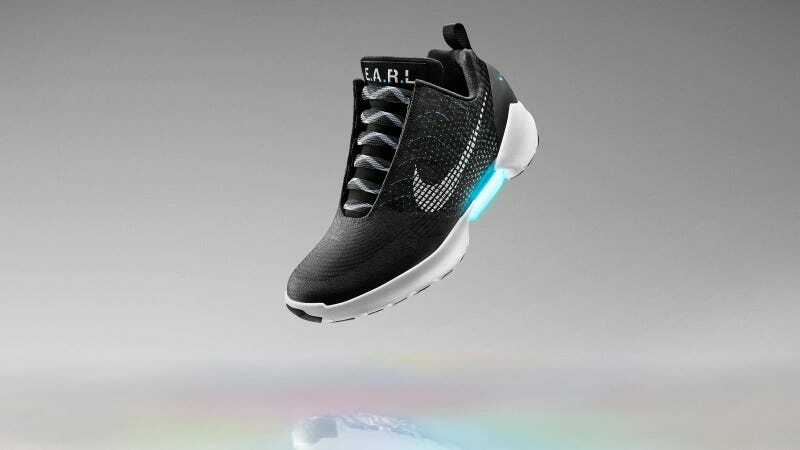 The Nike HyperAdapt 1.0 will be the first real Nike shoe to implement the adaptive lacing tech and it’s supposed to work just like it did for Marty McFly. Put them on and it magically tightens up around your feet. That sounds about right! The adaptive lacing technology isn’t fully automatic though. As in, it won’t just tighten and loosen on the fly. Along with the heel sensor, you can adjust the power laces through a button on the side of the shoe. This isn’t purely just a gimmick (it’s a lot of gimmick though) because the idea is that the added benefit of these power laces is that the shoe’s laces will give the same sort of consistent scrunching and tightening each time. Bunny ears be gone (though who knows how the power lacing gets charged up). The Nike HyperAdapt 1.0 is supposed to come out during the holiday season of 2016 in three different colors. No word on price yet but it’s probably safe to assume that you’ll need to start shining up them pennies.